Chroma ATE has introduced its new Chroma Optoelectronic Source Measurement System designed for burn-in, reliability and life testing of optoelectronic components. The system is being unveiled this week at SPIE Photonics West in San Francisco, CA. Jan. 23, 2012 - PRLog -- Chroma ATE, a world leading supplier of electronic test, measurement, and manufacturing equipment, has announced its new Chroma Optoelectronic Source Measurement System designed for burn-in, reliability and life testing of optoelectronic components. The system is being unveiled this week at SPIE Photonics West in San Francisco, CA. Key features of the system include support for up to 800 channels, up to 40 A per device, up to 150° C, batch processing via device carriers, and a Conversion Kit Interface for adaptation to multiple products. The Chroma 58601 is a high density, precision multi SMU (Source-Measurement Unit) Module with temperature control and exchangeable interface developed for burn-in, reliability and life test of optoelectronic components including laser diodes, LEDs, OLEDs, photo-diodes and other similar components. Each module has up to 80 discrete SMUs which may be used as device drives, device biasing and/or measurement. 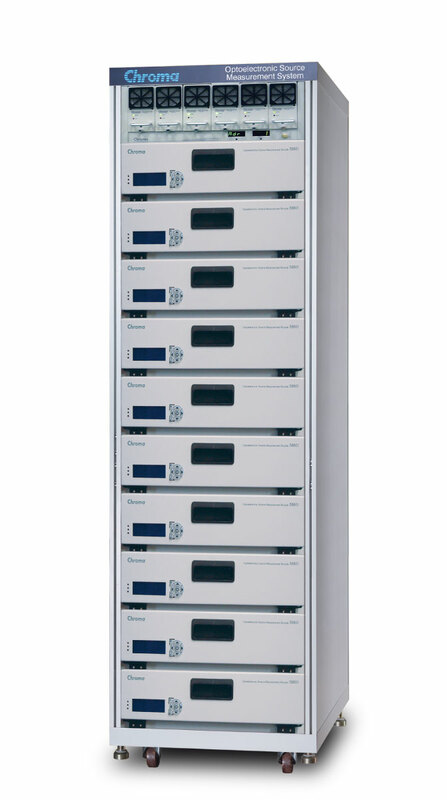 Five power levels are offered where discrete SMUs are available to 5-amps and series device drives for 20-amp and 40-amp sources. Discrete voltage measurements are available for high current devices placed in series. Multiple current sources may also be paralleled (exchanging the conversion interface board) to support higher power devices. • Higher temperatures reduce aging times and provide quicker results while lowering cost by requiring fewer channels. • The high density design reduces floor space over other similar solutions. • Batch processing is performed through device carriers. Carriers may be used between aging and characterization testing. Software tracks acquired data between all Chroma testing. • Same base system may be used for many device types. A Conversion Kit provides quick, cost effective adaptation to prototypes and new products or variation in production. • Fine pitch probing for aging of small sub-assemblies prior to expensive packaging. • Hot swappable power supplies eliminate this type of failure mode while reducing MTBF / MTTR. The Chroma Optoelectronic Source Measurement System available for order directly from Chroma ATE, Inc. by visiting their website, http://www.chromaus.com, or calling 1-800-478-2026 (1-949-421-0355). Founded in 1984, Chroma is a respected world leading manufacturer of complete Electronic Test and Measurement Solutions for commercial, automotive, military and government industries. Utilizing in-house Automated Handling and Manufacturing Execution System (MES) expertise, Chroma specializes in integrated and fully automated turn-key electronic test and manufacturing solutions for green technologies including LED, solar cell / module and Electric Vehicle (EV) as well as battery formation, test & grading production solutions. In the USA Chroma is headquartered in Irvine CA, with worldwide engineering service offices in the United States, Taiwan (corporate headquarters), Europe, China, and Japan. For more information, visit Chroma’s website at http://www.chromaus.com. Chroma is a world leading own brand supplier in electronic test and measurement equipment and systems. Chroma provides integrated and customized turnkey solutions in test and measurement instruments, automatic testing and manufacturing execution systems.